After watching Manjhi – The Mountain Man, I came out of the theater with a buzzing mind. My eyes had turned a bit moist towards the end of the film but I also had a slight ache quietly making its way into my head. I had a lot of questions running through my mind, several visuals were stuck in my head but, also, a strange sense of incompleteness had infiltrated my heart. After a lot of deliberation between my head and heart, I realized that Manjhi is not a great but a very significant film. Significant because you should watch it to believe how a lot of love and a bit of madness can make a man take on the mountain, and how horrifying are the twin social evils of casteism and poverty. Why does it fall short of being a great film? Well, we will dig into that a little later. If you realize, there is a flip side to Dashrath Manjhi’s otherwise fascinating story. The long and arduous journey of the Mountain Man, as he his fondly and rightly called, can actually be summed up in a couple of sentences- “Dashrath Manjhi, a poor landless laborer from Bihar, worked meticulously for 22 years to carve a road out of a mountain using only a chisel and hammer. Aggrieved by the untimely demise of his wife, who died due to lack of medical attention, Manjhi took it upon himself to wage a lonely war against the mighty mountain that blocked basic amenities from reaching his village.” That’s it. Yes, Dashrath Manjhi’s story is of ultimate triumph of human spirit and determination against all odds but it’s elements of drama and struggle are watered down because of the huge time period that it covers. How exactly can you bring in the moments of struggle, happiness, dejection, joy and drama in the story of a man who does the same thing for good 22 years? To put it in a few words, Manjhi’s story does not have the typical contours of adventures that we usually associate with biographies and heroic stories. Keeping this aspect of the story in mind, you cannot help but appreciate director Ketan Mehta’s tenacity and honesty in putting together different beads of Dashrath Manjhi’s remarkable life into a singular and mostly cohesive strand. At times, Ketan Mehta, who has films like Mangal Pandey and Rang Rasiya to his credit, does go overboard with flashbacks of romance and also meanders a little in a bid to deliver a fitting finale. But, more or less, the soul of Manjhi – The Moutain Man is always blemish free. 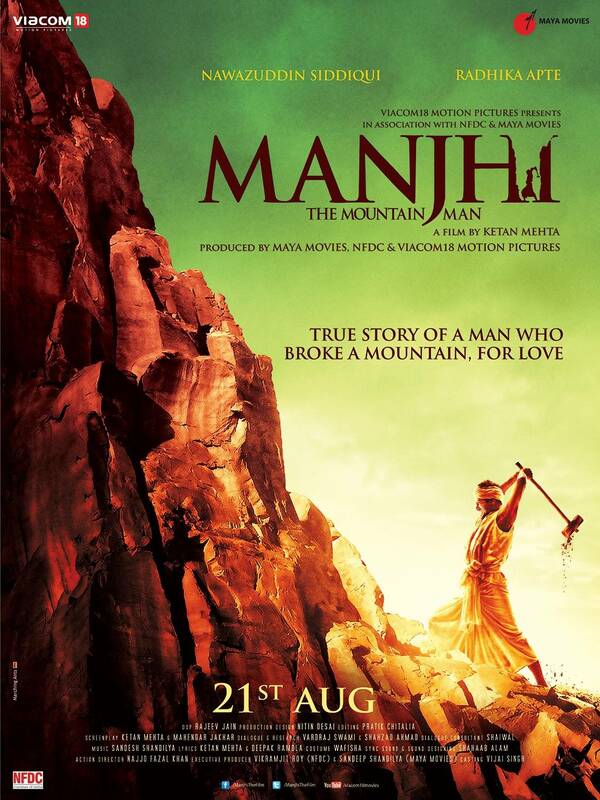 In fact, the film does a good job of tracing significant events of Indian history through the prism of Manjhi’s life. The sequence where Manjhi actually comes face to face with none other than Indira Gandhi took me by complete surprise and so did his march to Delhi during the times of Emergency. It is these small and rather unknown snippets of Manjhi’s life that the film brings out brilliantly. The film is crisp at 2 hours and 5 minutes but comes across as a little dragged because of the incoherent screenplay. Taking a non-linear approach of narration, the director shuffles between different time zones in 22 years, and it somehow breaks the rhythm of storytelling. These hiccups in storytelling aside, the film makes an honest bid to showcase the evils of untouchability and caste prejudice that existed in newly independent India. Manjhi – The Mountain Man has some terrific moments that bring out the horrors of caste oppression and depressing poverty. There are chilling scenes of poor and landless villagers being brutally beaten up, left to live in extreme poverty or worst, left to die in a burning brick furnace. The film is equally efficient at highlighting the systemic issue of corruption and administrative apathy that plagues India and most of its underdeveloped states. In the acting department, the film is an out and out Nawazuddin Siddiqui show with the talented actor putting up a very restrained and nuanced performance that is very different from what he has been doing so far. When Nawazuddin plays the younger Manjhi, there are elements of his trademark humor and earthy acting, but he actually comes into his own while portraying the much older, aggrieved and almost maniacal version of Manjhi. The pain, the anguish, the tears, the toil – Nawazuddin embodies all of these emotions to bring out a character that is carved with flesh and blood. The actor must have pushed his limits while shooting this film and it is clearly visible in scenes of great human struggle and survival. Radhika Apte looks beautiful and gets into the character of Manjhi’s wife, Phagunia, with utmost ease and spontaneity. She is a complete natural and leaves a big impact in a role that is completely deglamorized and required dialogues to be delivered in unadulterated local dialect and Bihari accent. Pankaj Tripathi is fantastic as a cunning son of the village Zamindar and gets his accent and mannerisms spot on. Ditto for Tigmanshu Dhulia who somewhat reprises his Ramadhir Singh act of Gangs of Wasseypur. The overall impact of the film suffers due to some tacky VFX and excessive use of Chroma in some of the scenes. Similarly, a couple of dream sequences look very unreal and add to the overall randomness of the middle portion of the film. The film’s music (Sandesh Sandilya and Hitesh Sonik) and background score is average while the dialogue are effective, crisp and as per the local flavor of Bihar. Overall, Manjhi – The Mountain Man is sprinkled with some fine renditions of human struggle, madness and love. The sparkling chemistry of Nawazuddin Siddiqui and Radhika Apte lifts the film to a great extent and it is precisely because of this reason that you feel triumphant and joyous when Manjhi finally accomplishes his task. The film could have been much more than what it is, but it is definitely worth a watch for the sheer significance of the story and some honest portrayal of our society’s stark realities. ← Movies and the Misogynist Concussion! Agree. 🙂 And I think, Danny Boyle did a better job of making a 2-hour film from a one-line story.